Andhra Pradesh is located on the southeastern coast of India. It is the seventh largest state by area in India. Hyderabad is the major educational hub and the capital city of this state. There are various top engineering institutions like Indian Institute of Technology (IIT) & National Institute of Technology (NIT) are located in this state. The higher education in this state is administrated by the Department of Higher Education. According to the census 2011, the literacy rate of this state is 75.60 %. 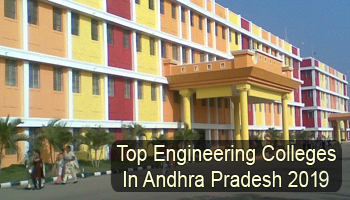 Here we are presenting a list of Top Engineering Colleges in Andhra Pradesh 2019. At Sarvgyan.com, we have provided a list of top engineering colleges in Andhra Pradesh 2019. In this list, we have included IIT – Hyderabad, NIT – Warangal & various other private and government colleges which provide education in the engineering field. Various colleges and institutions of Andhra Pradesh state have been rated on the basis of different factors. Some important factors are national importance, quality education, college affiliation and approval, infrastructure & facilities provided by colleges, student’s preferences, placement records, etc. Jawaharlal Nehru Technological University, Kakinada organizes a state level examination (AP EAMCET) for providing admission in B.Tech, B.Pharm & other courses offered by different colleges in Andhra Pradesh. Students can also apply for admission on the basis of JEE Main scores. It is necessary to qualify the JEE Main & JEE Advanced exams to get admission in IIT. For admission in M.Tech programme, students can apply through GATE exam. Students can pursue engineering courses in different specializations. Some trending specializations are Civil Engineering, Computer Science and Engineering, Aeronautical Engineering, Mechanical Engineering, Electronics and Communication Engineering, Electrical & Electronics Engineering, etc. For any other queries about Top Engineering Colleges in Andhra Pradesh 2019, you may leave your queries below.